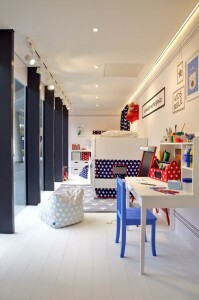 6,000 square foot retail space dedicated to children’s furniture, family home interiors and toys. Opened on Friday 29 April 2016, No. 12 Buckhold Road, Wandsworth, London, SW18 4GP. Great Little Trading Co (GLTC) is an award-winning retailer of children’s furniture, home accessories and classic wooden toys. Founded in 1996, Great Little Trading Co offers its own unique modern British designs to help parents create inspirational spaces for children which look good in the family home. Key products include smart storage for toys, books and clothes, children’s bedroom furniture and bedding, curtains and rugs, desks and desk accessories, dressing tables and toys. The large store will deliver the same exceptional customer service for which GLTC is renowned online. Friendly and knowledgeable sales experts will be on-hand to offer personal shopping and interior design advice, making the showroom a unique shopping experience for parents looking for innovative design, quality, attention to detail, longevity and the highest safety standards.